One more of flying into London today, with Hyde park in foreground. Colour/channel-swapped 590nm image from a full-spectrum Olympus e-M5 with a 590nm lens filter. Colour/channel-swapped in GIMP. This entry was posted in Images and tagged flying, hyde park, infrared, london on April 30, 2015 by nigelbeighton. Flying over western France today. 590nm images from a full-spectrum Olympus M5 with 590nm lens filter. This entry was posted in Images and tagged 590nm, flying, france, infrared on April 30, 2015 by nigelbeighton. Amazing conditions tonight flying into London, great visibility, light and cloud formations. The fates smiled upon me with the window seat at the back of the aircraft (thank you fates). 590nm images from a full-spectrum Olympus M5 with a 590nm lens filter. This entry was posted in Images and tagged 590, brentford, buckingham palace, hyde park, infrared, london, thames, westminster on April 30, 2015 by nigelbeighton. One of the questions I have had is, what happens with a bandpass filter if you cut out near-UltraViolet. Bandpass filters, like the Scott UG1, UG5 and BG3, mix UV with IR; effectively letting in some blue/violet and negating the need to colour/channel-swap. Using a Hoya UV HMC(0) filter, which has an aggressive cut off right on he 400nm, stacked with UG5 and BG3 filters, helps answer the question. The results, from a little test this morning are below – the left image is the straight bandpass filter and the right image is with the UV(0) filter added. There is not a lot of difference in reality, the UG1 shows the biggest difference but then it has the weakest UV and IR intake. You easily make the images on the right with a simple tweak, post shot, on the computer. The answer I guess, is that cutting out near-UV does not really do much at all. All image and content rights reserved. This entry was posted in Howto and tagged BG3, infrared, schott, UG1, ug5, uv on April 30, 2015 by nigelbeighton. Heathrow and West London. A solarized infrared image from a 720nm lens filter on a full-spectrum Olympus e-M5. This entry was posted in Images and tagged 720nm, heathrow, infrared, london on April 29, 2015 by nigelbeighton. Fly past Queen Mary’s reservoir, out of Heathrow on the way to Zurich. Colour/channel-swapped Infrared image from a 720nm filter on a full-spectrum Olympus e-M5. Strange little clouds over France. This entry was posted in Images and tagged 720nm, clouds, france, heathrow, infrared, queenmarysreservoir on April 28, 2015 by nigelbeighton. This entry was posted in Howto and tagged crash, kites, KPA, peter lynn on April 27, 2015 by nigelbeighton. Marble Hill park and house this afternoon. Straight (‘raw’) 720nm images, with no colour channel-swap, from a full-spectrum Olympus e-M5 with an IR720 lens filter. This entry was posted in Images and tagged 720nm, infrared, marble hill park, Richmond on April 25, 2015 by nigelbeighton. 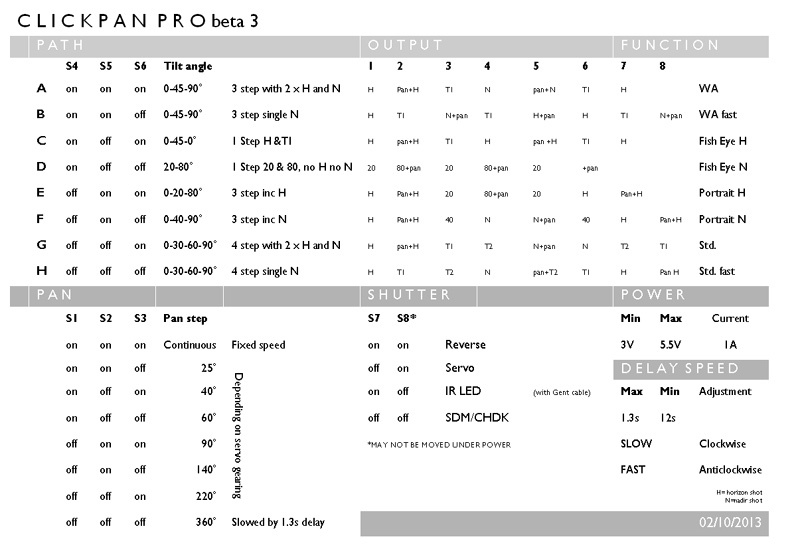 For those that are using the common Gentles clickPAN-PRO controller on their rig (I use mine with a KAPshop Modular1 rig), here is the set-up and configuration manual: clickPAN-PRO – I had a little trouble find it initially so thought it worth posting. Also knocked up this diagram to help. The key is which three point plug goes where. Read the diagram left to right, looking at it the same way in the pic. The plug/connectors should be, left to right (again looking the same way): yellow/white, red, black. This entry was posted in KAP and tagged clickpan, clickpan-pro, gentles, kap on April 25, 2015 by nigelbeighton. Like most long term Apple Aperture users (version 3), I am now forced to face the dilemma of what to do: migrate to the new dumb & dumber Photos app, migrate to Adobe’s Lightroom (and their insidious payment plan) or spend endless days searching the internet for that inexpensive, but functionally brilliant, holy grail alternative. I really like Aperture and have invested considerable time and effort in it, with the rewards. I get that Apple has given us fair notice of the the change/drop, but I still feel stranded and let down. For now, I will hold on to Aperture for as long as I can, in the hope that the likes of Topaz and Google Nik fill the gaps with Photos or someone like Serif steps into the gap. Good as Lightroom is, Adobe and their insidious subscription plan is just too painful right now. Here is hoping that any up and coming Apple patches and OSX releases do not switch Aperture off. Apple you let me down; not all of us are the dumb users you seem to watch to now sell to. This entry was posted in Info and tagged aperture, apple, migration, photos on April 20, 2015 by nigelbeighton.